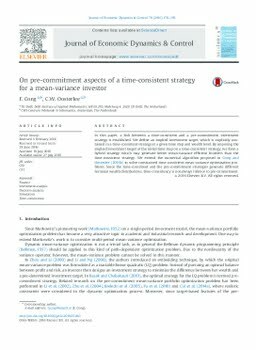 In this paper, a link between a time-consistent and a pre-commitment investment strategy is established. We deﬁne an implied investment target, which is implicitly con- tained in a time-consistent strategy at a given time step and wealth level. By imposing the implied investment target at the initial time step on a time-consistent strategy, we form a hybrid strategy which may generate better mean-variance efﬁcient frontiers than the time-consistent strategy. We extend the numerical algorithm proposed in Cong and Oosterlee (2016b) to solve constrained time-consistent mean-variance optimization pro- blems. Since the time-consistent and the pre-commitment strategies generate different terminal wealth distributions, time-consistency is not always inferior to pre-commitment.